If the tower existed before formal formation of the parachute brigade, It's a fair assumption that the parachute training tower was built initially for the 4th Polish Cadre Rifle Brigade. This indicates that even before the Brigade changed its name to a "parachute" brigade, there were already plans in place to have parachute trained polish soldiers. An 8 storey parachute tower (that looked a lot like a crane) was built in 1941 (Completed 25 Augsut 1941) by the Chief Command Staff, besides Lundin Tower in Lundin Links, on the Pilmuir Road side of Lundin Tower. It's arm was 5 meters long. The tower cost £500 to build and was 100 feet high (Some reports say 75 ft, maybe the head of the arm was 25ft high, meaning the jump was from 75ft but the actual height of the crane was 100ft?). It's purpose was to simulate parachute descent. Some say the parachute training tower of the 1st Independent Polish Parachute Brigade (1 Samodzielna Brygada Spadochronowa) was built to Polish engineer Iwanowski's specification. Other statements confirm that the design of the tower was then copied back in Poland. However, the publication "Operation Market Garden Paratroopers Vol 2 (Piotr Wikkowski) states on page 104 "...was the work of Polish designers of the Engineer Technical Bureau and the Brigade's engineers" this quote came from the source Spadochroniarze, Warsawa 1991 Page 190 (J.Tucholski). 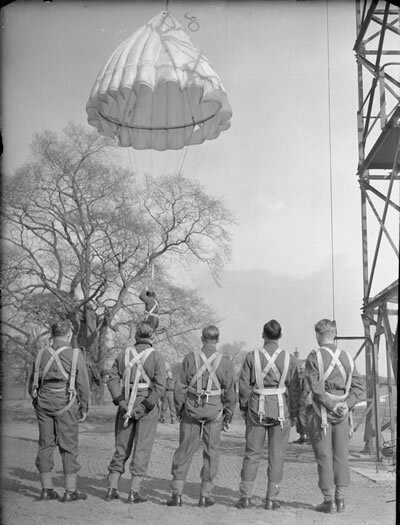 Either way, history supports the fact that subsequent parachute towers in both the UK and the USA followed the specification of the "Largo House" parachute tower. An Odd Location For The Tower? Although Largo House would be the logical place for the tower to be located it is however exposed directly to the North Sea and strong winds. Likely this is not ideal for training purposes and so the tower is sited between the hills, over in Lundin Links. Was this site chosen because it was part of Largo Estate at the time? What was the connection between the site of the parachute tower and Largo House? This is unknown at this time, but if I find out I shall report back!